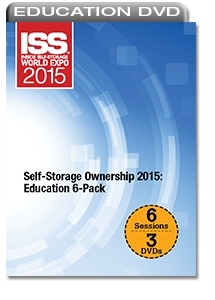 Get six education sessions that address important aspects of self-storage ownership. This discount bundle offers insight to competing in crowded markets, property taxes, security and more. Buying and Operating Your First Self-Storage Property: Year-One Success- Stress and confusion can accompany your first self-storage acquisition and learning operational best practices. This session eases the burden of new ownership by offering key steps to first-year success. Coping With the Stress of Being a Small Operator in a Big Self-Storage Market- While large self-storage companies possess certain operating advantages, independent owners can carve out healthy market share by implementing smart strategies related to marketing and money management. Creating Your Self-Storage Security Program: Tools and Practices- Learn about best practices and cost-effective technologies that can add sophistication to your self-storage security program. Studying Your Self-Storage Competitors and Leveraging the Data– Learn how to gather and leverage data about competitors to market your points of differentiation. Tactics to Reduce Your Self-Storage Property Taxes - Find out why self-storage facilities should be taxed differently than other types of commercial real estate and learn how you can lower your taxes through an appeals process. The 5 Mistakes We Made in Self-Storage (And How We Fixed Them) - Learn about common operational mistakes and how to correct them, including who to trust to run a facility, common marketing errors, how to underwrite property income and expenses, and more. For more detailed descriptions and previews of DVD content, please refer to each DVD’s individual product page.